The Ryeland is one of the oldest of British breeds going back seven centuries when the monks of Leominster in Herefordshire bred sheep and grazed them on the rye pastures, giving them their name. They were considered to have the finest wool of all British breeds of the time. Queen Elizabeth the First was given 'Lemster' wool stockings and liked them so much that from then on she insisted only on 'Lemster' Ryeland wool. An Elizabethan observer wrote that 'among short-wools, Ryeland has pre-eminence with Leominster as the centre of its trade'. In 1783 Ryeland wool was sold at 2 shillings a pound, when ordinary wool fetched only 4 pence. Observations on Live Stock: Containing Hints for Choosing and Improving the Best Breed sof the most useful kinds - Published 1804 - written in 1785 AN ACCOUNT OF HEREFORDSHIRE RYELAND SHEEP. QUERIES?�What sort of ground are the sheep bred on ?�how are the lambs wintered�on hay or green fodder ?�at what age are the sheep killed,�what weight of flesh�ditto of wool,�and common price ?�how are the lambs summered�how the sheep, whether on commons or inclosures? for other sheep : but this sort will not require so " Any sort of dry sound land that is healthy good keeping as large sheep, and will pick the fallow a cleaner ; I suppose double the quantity may be kept, either on fallow, stubble, or poor pasture-land. " The lambs, when weaned from the ewes, about midsummer, are put upon old clover and rye-grass, or dry pasture-land, and wintered the same, except snow or very severe weather, when they have a little hay or pease-halm ; observe, not to give the lambs very good keeping after they have been from the ewes a month, till winter, when they will require better keeping, old clover, wheat stubble, or dry pasture ; and the oftenner their pasture is changed, the better. " The wethers are generally put from the store-sheep at Michaelmas when they are past three years old, kept well during the winter, and slaughtered fat the next summer at four years old. Some turn them to feed sooner, but that is .when the stock is too large for the keeping. The sheep certainly feed better at four years old than sooner, and the flesh better;.indeed they are put to feed at any time of the year that suits the owner, but should be near fat before winter (or turned off to feed as above): then they are put to turnips or good dry pasture, and changed often; sometimes kept in the house, and fed with hay and oats, with some water always in a trough by them ; which last is expensive, but the mutton excellent, the weight of the flesh from 50 to 80 pounds. A Ryeland sheep that will weigh 50 Ib. when good fair mutton, is often fed till he weighs 80 Ib.�The store-sheep, that have the finest wool are kept lean ; and the stock together, upon an average, produce about 1 1-4 Ib. each sheep, worth about 18d. or Sod. per Ib. last year it brought 2s. per'lb. The wethers produce from 2 to 3 Ib, each, and worth from 15 to 18d. per Ib. If the store-sheep are better kept, they grow larger, and produce more wool, but inferior in quality." The lambs I have mentioned above, till they are a year old, when they will pasture with the flock; only they should not be put in the sheep- cott by night, and, if convenient, should be kept a little better. The store-sheep, except yearlings and two-year-olds, upon the corn-farms; and where the wool is finest, are put in the sheep-cott by night, and all the year round, and their cratches filled with pease-halm, wheat-straw, barley-straw, or any other dry food, which they eat and make clung of: the dung enables the farmers to raise good crops of barley, &c. and the sheep pasture by day, on old clover and rye-grass, dry pasture, fallow, stubble, &c. but are always kept very lean, and graze quite short: when there is not convenience of putting them in the sheep-cott by night all the year, they do it from the beginning of winter till April or May, when the lambs are able to lie out by night. The ewes must be kept in by night at the eaning time, and when the lambs are very young, or the cold nights will kill the lambs, their wool is so very short; but if they are healthy, at a week or fortnight old they will bear to be out at night.The sheep are pastured upon commons, open fields, or inclosures, provided the land is dry and healthy for sheep, and when there is no conveniency of putting them in a sheep-cott by night at weaning time. The sheep must not be quite the finest sort of wool, but mixed with a stronger wool: it will then be more in quantity, though about 2d. a pound less in value: and if the ewes cun be oat of doors, the lambs bear the cold better ; but if they cannot be put in the house at lhal time, should be seen often, and put where tliey are best sheltered from the cold." Mr. Pye, a Herefordshire farmer, also told me that the store or keeping-sheep are put into cotts at night, winter and summer, and in winter foddered in racks with pease-halm (straw) barley-straw, Eccept in very bad weather with hay. These cotts are low buildings quite covered over, and made to contain from one to five hundred sheep, according to the size of the farm, sheep- walk, or flock kept. The true Herefordshire breed are properly called Ryeland sheep, from, the land formerly being thought capable of producing no better grain than rye, being a tract of very poor land, but now found capable of producing almost any kind of grain.�They give only 12 1-2 Ib. to the stone of wool, which was sold last year (1784) for 24s. and mr. Pye never remembered it being sold for above 25s. which is a higher price by much than any other wool I know of in these islands. Dr Caleb Hillier Parry of Bath, �(1755-1822) obtained pure merino rams from Lord Somerville who imported merinos from Spain in 1801, and was able to demonstrate that excellent fine wool could be produced in a flock of Ryeland Sheep after 4 generations, a product almost equal to the besty Spanish in fineness and texture. The sheep were known as Merino Ryelands and the wool as Anglo-Merino. Typical characteristics of the Merino. the tuft on the head and the loose skin hanging from the throat (throatiness) could also be discovered in some Ryeland sheep, "showing its origin" to an extent that a good judge, T.A. Knight, could readily "distinquish these from "Achenfield" or true Ryeland sort". Dimock is a parish containing 3500 acres, distant four miles N. from Newent, and twelve N. w. from Gloucester. The soil is generally of sand, in some places inclining to loam, and applied in about the proportion of a third part to the production of wheat, barley, and peas. Eight hundred acres are in wood, and the rest in pasture. Apple and pear trees are planted in the open fields, and the oak and elm grow in great luxuriance. The small Ryeland sheep are bred here, and it is said, that King Edward selected the sheep which he presented to the Spanish monarch from this parish. The Herefordshire breed of Sheep is almost equally as celebrated as that of its cattle: the name by which they are distinguished is the Ryeland, from a district in the southern part of the county, where the most superior varieties are fed. They are small, white- faced faced, and hornless; the ewes weighing from nine to twelve and fourteen pounds the quarter; the wethers, or ' wedders,' from twelve to sixteen and eighteen pounds. In symmetry of shape, and flavour of their meat, they are superior to most flocks in England ; and in the quality of their wool, they are wholly unrivalled. They lamb in February and March; but during winter, and particularly in time of lambing, the store flocks are generally confined by night in a covered building, provincially termed a cot; in which they are fed sometimes with hay, or barley-straw, but much more frequently with peas-halm. Some breeders accustom them to the cot only in very severe weather, and in lambing time. The manure made from the peas-halm is excellent, and in large quantities; whilst the practice of coting materially contributes to the health of the animal, and to the fineness of its fleece. The quantity shorn from each, does not average more than two pounds; but the quality is such as almost rivals that imported from Spain: the price is sometimes as high as thirty-three shillings the stone of 12 1/2 l untrinded; when coarse wool is only worth ten or twelve shillings. A cross has been made between the Ryeland and new Leicester sorts; to the advantage of the breeder, at least on good land; but to the detriment of the wool. The preservation of the original fineness of this staple commodity, or its improvement, are objects worthy of national attention: a cross between the Ryeland and real Spanish breeds, seems the most probable mode of effecting them, and many spirited breeders are now making the experiment. Leominster has been most usually celebrated as famous for this wool; but possibly it might have been the place of its sale, rather than of its growth ; as the rich pastures in that vicinity, and elsewhere, are generally supposed to have the effect of deteriorating the wool, Philips, the poet, writes thus: Can the fleece Boctic, or finest Tarentine, compareWith Lemster's silken wool ? Camden terms it, ' Lemster ore:' and Drayton asks Where lives the man so dull, on Britain's furthest shore, To whom did never sound the name of Lemster Ore ? That with the silkworm's web for smallness doth compare. Dyer, also, thus notices it in his poem on this subject: And beauteous Albion (since great Edgar chac'd The prowling wolf) with many a lock appears Of silky lustre: chief, Siluria, thine: Thine, f oga, favored stream, from sheep minute On Cambria bred; a pound o'erweighs a fleece. On the low lands, four or five miles on each side of Gloucester, the Ryeland sheep are principally fed; they have the range of extensive commons, where they soon fatten, and go off; which is an object of great importance, as it would be unsafe, on lands liable to rot, to keep a large breed of sheep/which require much time to finish for the market. In the Forest district, the same sheep, with a few of the Forest breed, are fatted on grass in summer, and turnips, with hay, or barley-meal, in winter: when fat, the Ryelander will weigh from ten to sixteen pounds per quarter: in the latter instance, it is suspected, that some cross has enlarged the breed. This indeed has lately been so much the case, that a genuine Ryeland sheep is scarcely to be found. If the Spanish Mixture, their Wool, and its Value in Superfine Cloth, &c. By C. H. Parry, M.D. F .R.S.� THe communicates the result of his own experience with Merinos crossed with Ryelands, in the compressed form of propositions: I That the wool of the fourth cross of the breed is fully equal in fineness to that of the male parent slock in England. ' 2.By breeding from select Merino Ryeland rams and ewes of this stock, sheep may be obtained, the fleeces of which are superior both to those of the cross-bred parents, and of course to those of the original progenitors of the pure Merino blood in England. 3. From mixed rams of this breed, sheep may be obtained having wool at least equal in fineness to the best which can be procured from Spain 4. The proportion of fine wool in the fleeces of this cross-breed is equal, if not superior, to that of the best Spanish piles. 5. Wool from sheep of a proper modification of Merino and Ryeland, will make cloth equal to that from the Spanish wool imported into this country. 6. Thin wool is more profitable in the manufacture than the best Spanish. 7. The lamb's wool of the Merino-fRyeland breed will make finer cloth than the best of that of the pure Merino breed. 8. Should longwool of this measure of fineness be wanted for shawls, or any manufacture which cannot be perfected with pure common coarse long Wools, this can be effected by allowing the ram's fleece to remain on the animal unshorn for two years. 9.. That though 1 have never selected a breeeding ram or ewe on account of any other quality than the fineness of thefleece, this stock is already much improved as to the form of its carcase, comparatively with the Meriuos originally imported.These remarks merit the attention of the breeders of sheep. General Treatise on Cattle, the Ox, the Sheep, and the Swine: Comprehending Their Breeding, Management, Improvement and Diseases. THE HEREFORD, Ross, OR RYELAND SHEEP. These, whilst they remained pure and unmixed, bore the finest fleece of any British sheep, and the nearest in appearance and quality to the Spanish wool. Their mutton had always an equal character for excellence, but no great quantity of it, in these times, finds its way to the London markets. They have been of late years much crossed with Dishley tups for the reasons before assigned, and it is averred, a fact for which I cannot answer, that they are now become far more tender, and worse in constitution than formerly, when they used to be esteemed a very hardy race. On those farms where they still cot their sheep, they are either kept in the cot by night, all the year round, or in the winter months only, their food being pease,barley, oat or wheat straw, in racks. The cots will lodge from one, to five hundred sheep, each. The provincial breed of sheep is termed the Ryeland, from the district so named lying partly in the county of Gloucester, and partly in this county, in the vicinity of Ross, which is particularly favourable to them from the dryness of the soil and the sweetness of the herbage. 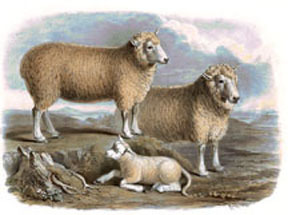 They are small and white-faced ; in symmetry of form, and in the flavour of their flesh, they exceed most English sheep; and in the fineness of their wool they are unrivalled : the ewes weigh from nine to twelve and fourteen pounds per quarter, the weathers from twelve to sixteen and eighteen. The Ryeland sheep have been crossed with the New Leicester, to the advantage perhaps of the breeder who is situated on good land, but to the detriment of the wool. A cross has been advantageously made between the Ryeland and the real Spanish breed. To the barrenness of the pasture on which the Ryeland sheep usually feed, may in some degree be attributed the fineness of their wool for the quality of it is immediately impared by a copious supply of food. The sheep-shearing in Herefordshire is performed by women.
" Where lives the man so dull on Britain's farthest shore, To whom did never sound the name of Lemster Ore; That with the filk-worm's web forsmallness doth compare?" The ringlets of the wool are equal in fineness to those of the Merino race, but they are rougher, in consequence of being more irregular in regard to size and surface. Though the wool does not felt well, it is supposed to jproduce the finest cloth of any in England. The breed of sheep in this highly favoured and most valuable county has long been almost equally as celebrated as its breed of cattle, principally for its fleece, which has long been famed for the silkiness of its pile, and the delicacy of its texture. The name by which the breed has been distinguished is the Ryeland. as in that district the best varieties have been fed, but the pure Ryeland have been crossed with the Leicester; this cross-breed being found to succeed far better than the pure Leicester or Southdown. The carcass has been materially improved on the old Ryeland, by the cross-breeding, but the Ryeland wool has been injured in its fineness. Leominster has been most usually celebrated for this wool. In the tract of country lying westward of the Severn, and bounded by the mountains of Wales, there has in every known period existed a race of Sheep, of small size, destitute of horns, and noted for the softness and fineness of their wool. The part of England where this breed was long the most diffused and cultivated was the county of Hereford, a tract of the old red sandstone formation, stretching from the confines of Wales to near the Severn. But the breed extended into Monmouthshire on the south, into Shropshire on the north, and into Gloucestershire and Warwickshire on the east, occupying many forests, commons, and wastes. The variety reared in the county of Hereford was generally termed the Hereford Breed. Sometimes it was characterized by the names of the places in which it was found in the greatest numbers or perfection. It was sometimes termed the Archen- field Breed, and sometimes the Ross Breed, from the southeastern district of the county lying between the Forest of Dean and the Malvern Hills. But it became at length more generally known by the name of the Ryeland Breed, from certain sandy tracts formerly devoted to the production ofrye, situated southward of the river Wye. We have no historical record of the derivation of this breed from any other country, and may therefore assume that it had been indigenous beyond all memorial to the districts which it inhabited. It may not unreasonably be inferred to be a variety of that widely-diffused race of soft- woolled Sheep which formerly extended from the mountains and islands of Scotland to the mountains of Wales, and which was probably in possession of the earliest Celtic inhabitants of the British islands. From its diminutive size, its patience of scanty food, and the lightness of its fleece, we may conclude that it was the native of countries of a low degree of fertility, probably of districts of forest, which, until cleared of their wood, are always unproductive with respect to the nutritive grasses. The county of Hereford, it is to be observed, though now rendered rich and beautiful by art, was formerly covered with woods, and interspersed with extensive commons and chases, which long remained waste and barren. "We are not therefore to conclude, that, because the country is now fertilized, it was not formerly suited to the maintenance of a race of small Sheep. The nature of the wool of this breed, too, which was noted beyond any other for its fineness, caused the breed to be preserved unmixed, and with nearly its pristine characters, long after the county of Hereford had become capable of supporting larger animals. The wool of the Ryeland breed was long regarded as the finest that the British islands produced. The ancient city of Leominster, being surrounded by a country producing his kind of wool, and being the market-town to which it was brought for sale, gave name to the wool of the country, which was termed Lemster Wool, or Lemster Ore. Drayton, who wrote in the reign of Henry VIII., when comparing the wool of the Cotteswold Hills with the lighter fleeces of Lemster, bears testimony to the superior fineness of the latter. Camden, describing the town of Leominster, " which," says he, " was also called Leon Minster, and Lyon's Monastery, of a Lyon that appeared to a religious man in a vision," says, " The greatest name and fame is of the wool in the territories round about it (Lemster Ore they call it), which, setting aside that of Apulia and Tarentum, all Europe counteth to be the verie best." A method of treating the Sheep of this part of England, calculated to preserve and increase the fineness of the wool, existed until a recent period. The animals were kept during the night in large houses termed Cots, capable of containing from 100 to 500 Sheep. This practice was probably adopted in early times, for the purpose of protecting the animals from the wolves which greatly abounded in the forests of the western counties. It may be supposed to have been continued afterwards by habit; but experience would shew that it was eminently calculated to preserve and increase that fineness of the wool for which the breed was distinguished. The animals in these cots were sparingly fed with pease-straw and other dry forage, a system eminently favourable to the production of a short and delicate fleece. The modern Ryelands, where they yet exist, retain the diminutive size of their progenitors. Their form is compact, and their mutton is juicy and delicate. They are gentle and well formed; and they are patient in a remarkable degree of scanty fare. Both sexes are destitute of horns. The colour of the whole fleece is white, and the wool extends forward to the face, forming a tuft on the forehead. This wool is yet the finest produced in England. It is not, however, equal in this respect to that of the Spanish Merino, nor so well suited, by its felting properties, for the purposes of the clothier, on which account, since the extensive introduction of the fine wools of Spain and Germany, its relative value has greatly declined. Further, the Sheep are of small size, and inferior in economical value to the races which the country is capable of maintaining. Hence, the inducement to cultivate the breed has been constantly diminishing, so that it has now almost ceased to exist in a state of purity. The smallness of the size of the Ryelands led to innumerable experiments in crossing, with the design of increasing the weight of the animals, and in the hope of maintaining the fineness of the wool. The experiments failed, as might have been anticipated, with respect to the preservation of the quality of the wool, but succeeded in increasing the size of the progeny. But the system of crossing, which excited the greatest attention, and from which the most favourable results were anticipated, was with the Spanish Merino, soon after the introduction of that celebrated breed into England. Strenuous exertions were used by individuals and public associations to introduce the Spanish blood, and sanguine calculations were made of the benefits likely to result to the woollen manufactures of the country. Time and experience have proved the fallacy of all these hopes, and left to agriculturists an instructive lesson on the principles of breeding. The first crosses promised well; but, in breeding from the mixed progeny, it was found that, while the wool had become inferior to that of the Spanish stock, the hardy qualities, the goodness of form, and the aptitute to fatten, of the English breed, were impaired. The crosses became remarkably diminutive ; and the whole labour of the experiments was found to have been thrown away. It was assumed that the Spanish Merino and the English Ryeland were the same race. A better knowledge of either would have shown that the two races were remarkably distinct in their characters; and that, if any of the English breeds were suited to this kind of crossing, it was the Dorset and Pink-nosed Somerset, and not the diminutive Ryeland. This species of crossing has been long in disuse, but numbers of the flocks in Herefordshire and the adjoining counties still exhibit traces of the Spanish mixture. Some breeders endeavoured to improve the native race by selection of individuals and superior feeding. The breed, however, was naturally diminutive, and numerous generations of Sheep must have passed away before this radical character of the race could have been changed. The system, therefore, was resorted to, of effecting the end by crossing with larger animals, as the Southdowns, the Leicesters, and the Cotswolds. It was found, however, that scarce any of our races of Sheep was with more difficulty amalgamated with others than the ancient Ryeland ; and a vast number of worthless Sheep were long produced in Herefordshire by these crosses. A better course was found to be, to substitute at once the stranger stock which it was proposed to cultivate. Numbers accordingly, chiefly Leicesters and Cotswolds, are now reared in the country, and the Ryeland breed is diminishing from year to year. The last great cultivator of the Ryeland Breed was Mr Tomkins of Kingspion, the distinguished improver of the modern breed of Hereford cattle. Mr Tomkins persevered in keeping up the breed of his native county. He succeeded in communicating to it greater symmetry of form, but he did not succeed in enlarging the size to the degree of rendering it of equal economical value with the races by which it has been supplanted. All the minor varieties of this once celebrated breed have partaken more or less of change. One variety, greatly distinguished, inhabited the Forest of Dean, a tract of the coal- formation lying between the Severn and Wye. This tract was formerly covered with one of the densest forests in England,�" So dark and terrible," says Camden, " by reason of crooked and winding waies, as also the grisly shade thereof, that it made the inhabitants more fierce, and boulder to commit robberies." By the discovery of mines in this forest, the woods were gradually thinned, and at last nearly extirpated ; and it then continued to be occupied by a kind of Sheep, which, until our own times, were held in the greatest estimation for the fineness of their wool. The Dean Forest breed has now disappeared in the pure state, having merged in the crosses of all kinds that have been made with it. This is one of our oldest breeds, having existed in Herefordshire from time immemorial. Its name is derived from the light sandy districts (old red sandstone) of Herefordshire, which, in early times, were supposed to be only suited for the cultivation of rye. It has always had the reputation of producing the finest quality of wool grown in this country, approaching that of the Merino, to which it bears also a marked resemblance in shape. The breed, however, is of small size, and the fleece though fine in quality is very inferior in weight to that of other breeds. Many attempts have been made by crossing to remedy these defects, but the success has not been sufficient to induce a perseverance in them, and consequently we find the pure Ryeland sheep every day becoming more rare, being replaced by others of a more remunerative description. In appearance, the Ryeland sheep have peculiar characteristics by which they are easily recognized. They are without horns, with white faces and legs ; the wool growing close over the head and eyes with a tuft on the forehead. They are a little low in the shoulder, with a round compact body, and particularly large and full haunches and stern. They are hardy, and thrive well on moderate keep ; feed readily for market, and, when at two and three years old, they weigh from 50 to 75 Ibs. each. The meat is considered of good quality, the fat being deposited internally instead of on the surface. The ewes are prolific and good mothers. There are sufficient historical grounds for supposing that the points of striking resemblance between the Ryeland sheep and the Merino may be traceable to actual identity of origin. The coast of South Wales is traditionally said to have been the seat of frequent colonization from Spain. Prize Animals Mr W.Taylor's Hereford Two Year Old Bull "Tambarine" - Mr W.Perry's Hereford Cow "Beauty"Mr F.W.Downing's Ryeland Ram - Mr J Booth's Hunter " Beechwood"
Gradually, as cultivation improved, more attention was paid to them, and, in order to increase their size, and also the weight of wool, the improved Leicester was resorted to. The succ�ss of the cross was very marked, and the Ryeland was superseded upon nearly all the dry sheep soils of the county. Since the days of Mr. Tomkins, the late Mr. Jauncey, of Mathon near Lcdbury, may be perhaps noticed as one of the most successful and determined breeders of the pure Ryeland, and amongst the breeders of the present day Mr. Downing, of Holme Lacy, near Hereford, has one of the largest and best flocks. His sheep won each of the prizes offered at the Royal Agricultural Society of England. He generally beats the Shrops, or divides the short-wool honours with them at Hereford, and his wool last year gained an honourable mention at the International Exhibition. His average clip last year was, he assured me, 84 Ibs., although he shears his lambs, and therefore has no tegs. He has fed 2 year-old wethers for Christmas up to 42 Ibs. per qr., and this year he realised 23d. per Ib. for his wool. There are many other pure bred flocks in the county, particularly in the woodland and heavy soil districts, for which they are peculiarly adapted, their thick fleece and well- covered bodies and heads bidding defiance to that prevailing pest, the fly. Among other present breeders we may mention Mr. Taylor, of Showle Court ; Mr. Taylor, Holmer; Mr. Arkwright, Hampton Court; Mr. Ballard, Leighton Court ; Mr. McCann, Malvern ; Mr. Pinches, Pembridge, &c., &c. It is said by those best able to judge that such is the peculiarity of the soil and climate of the county, that no matter what the breed of sheep is that may be imported into it, they soon degenerate, and yearlv approximate nearer and nearer to the Ryeland.The farm at Westonbury, which is about It miles from Pembridge and fourteen from Monaughty, is held under Edward Coates, Esq., and consists of about 315 acres of deep loam. It is on a clay subsoil, and grows good wheat, roots, and beans ; but is not suitable for barley and oats. A range of hills faces it on the N. and N.W. Beginning in the far distance with Snowdon, the eye glances along them past the church tower of Stanton, on the Arrow, Coombes Wood (that neutral cover of the Lndlow and the United), Nash lime rocks, above the home of asdy Langdale, at Eywood, to the summit of Knill Garroway, where three yews stand in mournful fellowship, to mark the limits of three parishes ; and then miles away into the heart of Radnorshire, over Kington Hollow and Hcrgcst Ridge. The flock consists of about 70 ewes, a cross between the Leicester and Ryeland, which arc crossed again with Ryeland tups, from Mr. Downing's, of Holme. Mr. Rea tried Shrops and Southdowns at first ; but he had to adopt the native sheep, as the foreigners were more liable to foot- rot, and did not bear the cold so well. The late Mr. Rea found the Shrop and mountain cross not hardy enough for the hill, and he, too, fell back on the Ryeland. 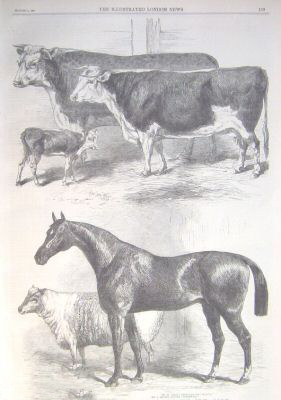 Of this breed, which was hardly represented in sufficient numbers to give it the prominence it deserved at Worcester, a well-known Herefordshire farmer thus writes us :� " The rotundity of their bodies, their thick scrags, the fulness of their chest, and shortness of legs, bespeak them to be a hardy race of animals. Their wool is fine and remarkably thick, and covers the whole body from the nostril to the foot. There is great peculiarity in their appearance, from the large bushy topknot, which is generally so full that the animal's eyes are obscured from view. The mutton is much sought after, as there is an abundance of flesh, and it is highly esteemed at Malvern for its fine quality by all who visit that lovely spot. They are the indigenous breed of the neighbouring county of Hereford, aud some half a century ago were as general as the ' white faces.' The wool was held in such high repute that it supplied one of the ' five We.' for which the county's fame was renowned some centuries back. In the latter part of the past and the early part of the present century, that great pioneer in cattle breeding, the late Mr. Tomkins, was also highly celebrated for his Ryeland flock. The Ryeland loses its rare breed status to become listed as a "minority" breed in the UK. From the archive of the Herefrod Timesfirst published Thursday 31st May 2001. THE Ryeland, a rare breed of sheep native to Herefordshire, is exempt from slaughter programmes associated with foot and mouth.The Ryeland is one of 30 breeds of sheep and goats to be included in the rare breeds scheme.Said Rosemary Mansbridge, chief executive of the Rare Breeds Survival Trust: "It is excellent news for the remaining flocks of Ryelands which are at risk of extinction. We wish the order had come sooner." 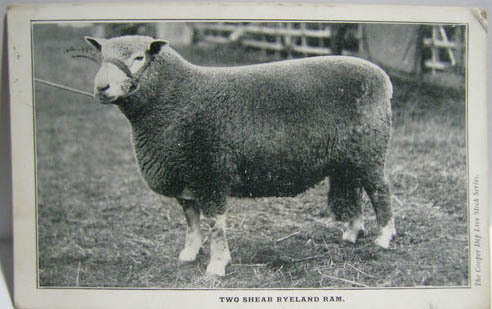 It is known that during the 20th century Ryelands were exported to Australia (1919), New Zealand (1902), Argentina, South Africa, Ireland, Russia, France, Germany, Italy, Portugal, the Netherlands and Canada and USA.The first importation of the Ryeland sheep into America was made by Mr. George McKerrow, of Pewaukee, Wisconsin, early in the summer of 1907. It is not known whether any Ryelands are found in USA today.